Abstract: Pixel response times are primarily a concern of gamers, or in situations where applications do a lot of continuous scrolling. 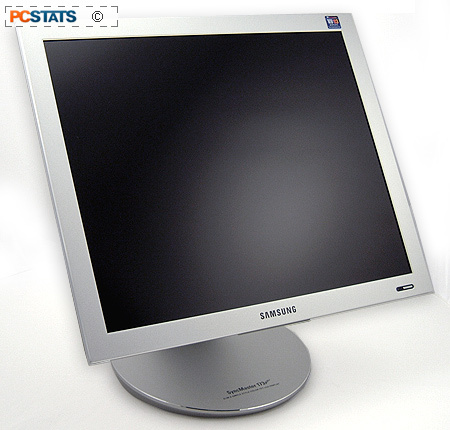 The first generation Samsung Syncmaster 173P LCD monitor was a sleek white unit that could pivot its screen around 180 degrees to be viewed as a portrait, or fold up in to a compact package and mounted to the wall. Its' 17" screen was bright, crisp, and a pleasure to work on. The new Samsung 173P+ incorporates all of the original models best physical attributes, along with a better contrasted 17" LCD panel and 8ms gray-to-gray pixel response time. Samsung has essentially switched out the old LCD glass with a panel that is a bit faster, and left the remainder pretty much as it was. Pixel response times are primarily a concern of gamers, or in situations where applications do a lot of continuous scrolling. Where a pixel response time of 16ms or less is preferred for the discerning gamer, 25ms to 30ms is more than suitable for standard computer work and DVD watching. These measurements used to be a clear cut, but now the situation is now becoming rather confusing. Pixel response rates have traditionally been defined by the rise-and-fall times of a single pixel changing state from 'on' to 'off,' and back to 'on' (the time it takes one pixel to change from black to white, and back to black), but in an effort to lower times many manufacturers are now quoting gray-to-gray pixel response times. "Gray-to-gray" means the millisecond value is a measure of the time it takes a single pixel to change from one shade of gray to another.... but without an approved standard from the Video Electronics Standards Association (VESA) for all companies to adhere by (as to what "gray" represents at either side of that scale), the measurement is rendered effectively meaningless. The compact little 17" screen of the Samsung Syncmaster 173P+ boasts a native resolution of 1280x1024 pixels. Its industry standard dot pitch of 0.264mm makes for a crisper image from the a-si TFT/PVA panel than many 19" LCDs can muster. The Samsung 173P+ does retail a bit higher than the average 17" LCD will, priced about $570USD, but it does offer up a contrast ratio of 1500:1 and brightness value of 270 cd/m2. Viewing angles on the Samsung 173P+ break the barrier at 178 degrees horizontal/vertical. The unit accepts both 15-pin Analog and DVI digital video connections, though DVI is naturally the preferred standard. Power draw is listed at 40 Watts while in use, less than 2 Watts in standby. A 75mm VESA mounting plate is included in the box along with wall mounting hardware and all the necessary cables to run the display. Manual, digital video cable, analog video cable, power cable and AC adaptor, software, VESA 75mm mounting wall bracket. 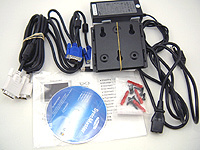 The Samsung 173P+ is intended to work in tandem Magic Tune 3.6 software (WinXP, 2K, ME) to control its display attributes. On the plus side, this leaves the 20mm-wide aluminum bezel on the front of the display completely free of control buttons. The downside is that users have to install yet one more program just to configure a monitor. The only button remains is the power button, and it it is a touch sensitive control rather than push-button. The button responds to the touch of skin, so glove wearing or otherwise covered fingers will not work. A small blue LED status indicator flanks the power switch. The power button is touch sensitive. Touch and hold it for a few seconds to set the 173P+ to cycle between the Analog and Digital video connections. According to Samsung, the Syncmaster 173P+ boasts several magical qualities: Magic Color, Magic Contrast, Magic Rotation, Magic Stand, Magic speed 8ms with RTA Technology, MagicZone, MagicTune, and MagicBright2. The majority of these 'Magic' features either enhance certain colour characteristics or brighten the screen for specific tasks like watching a movie, playing games, or viewing photos. Magic Rotation is interesting because it automatically senses when the 173P+ display has been rotated 90 or 180 degrees, and displays a small info box stating the rotated angle. In our tests however, the desktop did not automatically rotate with the screen, even though the Samsung online documentation seems to suggest this as one of its capabilities... For that, another program called PivotPro must be installed. Under Windows 2000 the PivotPro software worked well, but with Windows XP SP2 we were unable to get it working reliably. Regrettably, the pivot aspect of the 173P+ ended up being frustrating and largely non-functional on a WinXP-SP2 test computer due mainly to what appears to be software incompatibility issues. But on the bright side, when looking at the screen of the Samsung 173P+, bright colours are vibrant and the black areas of the screen are dark so that text and images stand out very well.